You may recall that there was a bit of trouble in the EMU last time. This year the Eugene City Club is holding it, off campus. 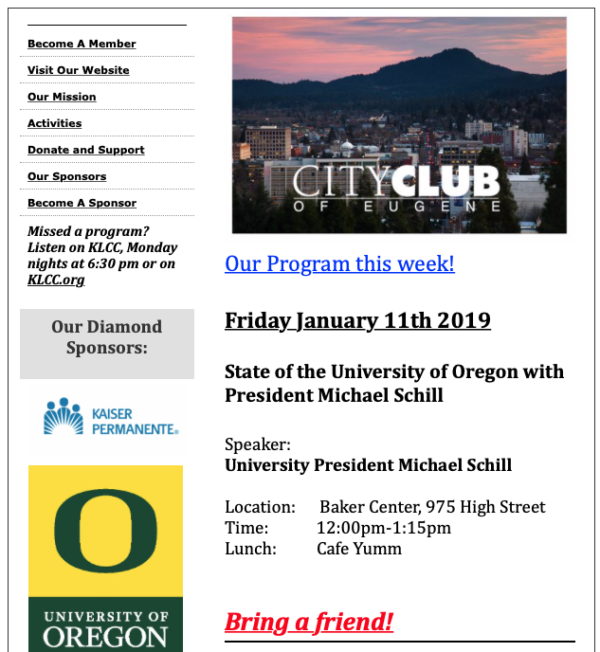 UO gave the city club a $5K donation to become a sponsor, contract here. I’ve been told by one City Club member that the club made assurances that it would make efforts to limit protests and disparaging statements, but the contract has no such clause. After a full, frank, and extended discussion led by Senate President Sinclair (Math) – with UO President Schill, Provost Banavar, and many UO Collective students present – the Senate voted 23-21 today to pass a revised version of US17/18-02: RESOLUTION TO SUPPORT THE UO STUDENT COLLECTIVE. This resolution was regarding disciplinary charges for Student Conduct Code violations brought by the administration against students who had protested at, and disrupted, President Schill’s October 6th State of the University Address. This resolution had been presented to the Senate and posted on its website for review two weeks ago. Yesterday afternoon President Schill and Provost Banavar sent a letter to the Senate responding to it. The UO Student collective took this response to heart, in part, and redrafted their motion last night and this morning, taking out some of the parts the President and Provost found objectionable and making general edits and explanation. The Senate received that revision shortly before the meeting today. The revised resolution was considered under a suspension of the normal rules, given the fact that time was of the essence, since the Student Conduct Office had given the students charged with disciplinary violations a firm deadline of December 8th to decide on how to respond to the charges, the students had exams, and that the next Senate meeting was not until January. After voting to suspend the rules with the required 2/3 majority, a motion was then made to divide the resolution, separating the parts on the student conduct process from the parts asking the administration to condemn speech by white supremacists. This passed with considerable support. The Senate then spent about 30 minutes discussing the student conduct part of the resolution. The resolution was read out in its entirety twice – once before division, and once after. Some Senators urged the Senate to delay, arguing that this was too little time to consider. Others argued that the students had been given a deadline and the Senate needed to act today. Provost Banavar asked the students if they would be satisfied if the administration would extend the Dec 8th deadline. The students asked if the Provost could promise such an extension. He said he could not. Senate VP Harbaugh (me) relayed that he had just been told by the Dean of Students that the Student Conduct Office had failed to make recordings or verbatim transcripts of the student conduct hearings held so far (and had prevented the students from making recordings), despite that fact that verbatim transcripts were required for appeals of conduct violations. Whoops. The Senate extended the time for debate several times. One OA Senator said that the OA’s would feel that passing the resolution would be taken as an attack on the OA’s who have the difficult job of enforcing student conduct code violations. This was received with respect. One Senator, from the law school, argued for delay and more deliberation, until next quarter. This same Senator had been on the UO Board of Trustees as its sole faculty member when they passed their 2014 motion taking authority for Student Conduct away from the faculty. At the time she raised no objection with the board that the Trustees were given that motion only shortly before their meeting, and she did not even bother to inform the faculty or the students that the motion was coming. The Greeks had a word for this: hypocrisy. One Senator raised the point that the motion could be taken as supporting students rights to disrupt classrooms. This did not get a lot of resonance with the faculty, who are quite experienced at turning student disruptions into teachable moments. Many of us even enjoy it. Here’s hoping VP Kyle Henley and the administration’s PR machine do not decide to give Duck spokesman Tobin Klinger instructions to go to the press with that canard. and yet despite this requirement, relevant peers have not been involved in this conduct code judgement process. 2.5 BE IT FURTHER RESOLVED that the Senate supports the conversations the administration has now initiated with the UO Student Collective and that the Senate will continue to provide a forum for all students. Having spent more than the expected time on the discussion and debate of this resolution, the Senate then adjourned, putting off the remainder of the agenda until January. Sorry, this is from the weekend, just catching up. ASUO President Amy Schenk’s Op-Ed was posted Saturday, along with a report from Saul Hubbard, “Backlash grows as UO pursues conduct charges for students who disrupted a Schill speech“. On Oct. 23, University of Oregon President Michael Schill wrote an op-ed in The New York Times headlined “The misguided student crusade against fascism.” His column was a reproach directed toward the students who protested his state-of-the-university speech. Schill condemned the protesters for supposedly stealing his right to free speech. He claimed that their actions exclude potential allies and portrayed himself as one of the student body’s strongest supporters, but chose not to respond to the students’ original concerns. We urge President Schill to invite these students in and work with them rather than publicly shaming them in a newspaper column filled with half-truths and mischaracterizations. He should take this as a sign that it is time to collaborate with students rather than punishing them with a vague student conduct code. At an institution of higher education, it is vital that student voices are included, not ignored. The University of Oregon’s administration is facing growing backlash over its decision to pursue student conduct charges against a group of protesters who disrupted a speech by UO President Michael Schill last month. The peaceful protest — about rising tuition costs and seeking a ban on white nationalist groups on campus, among other grievances — caused Schill to abandon his planned address. Student and faculty leaders are increasingly speaking out against the disciplinary move, which they characterize as divisive and futile. 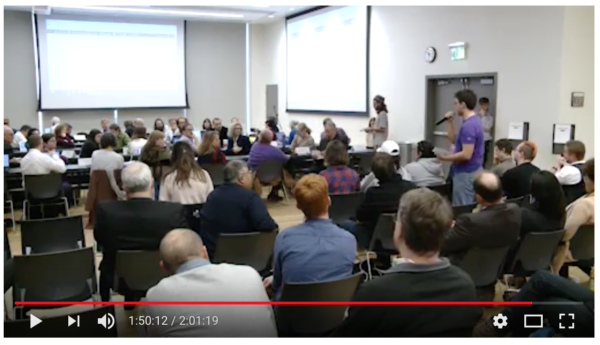 … At her Administrative Conference with Katy Larkin, associate director for investigations, group accountability, student conduct and community standards, Loustaunau presented Larkin with evidence that showed that Loustaunau was not at the protest. This evidence includes: screenshots of a Skype call from the time and date of the protest, screenshots of two texts that suggest she did not come to the UO campus that day until after the protest was over, a letter from her friend who she was on the Skype call with, a letter from her advisor and head of the sociology department who attended the protest and confirmed that Loustaunau was not there, and pictures of herself from the day of the protest, according to Loustaunau. In addition, her friend who she was on the Skype call with her confirmed over the phone that he was on Skype with Loustaunau at the time of the protest. A University of Oregon student who was charged with student conduct code violations for participating in a demonstration on Oct. 6 says she was not at the protest. In order to identify students to charge with conduct code violations, the conduct office looked at photos, videos and social media activity that was available, [UO spokesperson Tobin Klinger] said. [The student] said she will contest the charges and go through an administrative conference, where she can present information so that the conduct office has a full understanding of the situation. Presumably this also explains how Klinger was able to make his prejudicial statement to the Oregonian that “.. the demonstration actually violated university policy…” just 5 minutes after the protest ended. He knew the students were guilty, because he’d already read it on Facebook. This might raise a few entrapment issues? I’ve read about thought-crime, and I saw a movie about pre-crime, but leave it to the UO administration to charge a student with the latest: Facebook-crime. From the Emerald story here. We write in a unified voice as representatives of major constituencies at the UO to express our concern with the response of your office to the October 6, 2017 student protest of the State of the University Address. During the demonstration, activists took the stage and presented a list of demands created by a coalition of students. Your actions since this event have potentially endangered these students by calling out their actions in a national venue, and have escalated tensions in such a way as to obscure the concerns which precipitated the protest. Since the protest, you have availed yourself of campus, community, and national platforms to express your voice and reading of events. This is in contradiction to the claim that you were silenced. Further, your New York Times OpEd obscured the nature of the tensions that energized the protest and narrowly framed the circumstances in an analysis of free speech devoid of any consideration of the relationship between power and access to platforms for speech. Any appreciation of academic freedom and free speech must grapple with power. For faculty and graduate instructors, it is understood that any privileged platform brings responsibilities to assure speech opportunities for all voices in the classroom, not just the more vocal, visible and privileged. The bedrock of civil society rests on the parallel notion that democracy works when spaces are available for all voices, even those viewed as disruptive, unusual, or repugnant. In hearing these voices, a collective adjustment to institutions can be advanced to include the marginalized or oppressed, and repugnant or bigoted views can be rebutted. Power and platform are at the center of our practical applications of free speech and academic freedom. So far, you have not given consideration to this important dimension of the subject. The actions of your office, particularly your New York Times OpEd, have escalated tensions, and exposed our students to intimidation and ugly responses by online commenters. We find it disturbing that you did not anticipate this outcome. Under this national mockery, our students are castigated and put in a vulnerable position; they are denied an equivalent platform for their version of the events, and have lost any semblance of due process. We understand and support your call for debate and discussion about what transpired on October 6th. We also recognize that in this debate, the student activist perspective matters and needs consideration. That the protest lasted less than 15 minutes, and that there appeared to be only a slight effort to reclaim the stage by you or your staff, has left many wondering how much your departure from the room was pre-planned. Is discipline warranted if, as University President, you did not attempt to earnestly engage this minor protest? Major public universities, especially ones in the throes of state disinvestment, rising tuition, privatization, and shifting priorities, routinely experience visible protest. This recent event is no different. Instead of a healthy campus conversation, your administration is pursuing sanctions. The threat of sanctions stifle this important conversation. 7) Lack of just representation and counsel: the Office of Student Advocacy has denied fees-paying students advice, citing a ‘conflict of interest’ without explanation. These students were only given 7 days to respond, and this inability to seek out advice has severely hindered students’ ability to seek alternative counsel for this vulnerable situation. In our view, this has gone too far. It is time to de-escalate. We ask that you cease the punitive measures against students and engage in a dialogue without the cloud of threat or intimidation. The UO Student Collective, which includes students who were involved in the protest, will have the floor to present their concerns to the University Senate on November 15. This is a much better venue for beginning a campus dialogue than the other highly constrained venue that you have pursued thus far. Yesterday three of the students who received discipline letters (copy below) talked to the Senate about why they were going to fight the student conduct charges, rather than plead guilty and accept the administration’s rather mild punishment – a meeting with administrators and a note in their permanent record. There are also stories in the Daily Emerald here, and InsideHigherEd here. Today, members of the University of Oregon Student Collective have been sent notices from the university administration. We have been notified that students will be charged for participating in student protest and dissent against the administration. We have been told that we have two options: either submit to whatever guidelines they give us and silence ourselves or be formally charged by the institution of the University of Oregon. This will lead to a criminalization of protest and dissent. Students are being punished for speaking out and using their voice. The UO Student Collective will not accept any guidelines that take away our freedom to dissent and protest. The UO Student Collective will be contesting the allegations. The voices of the students are not a disruption to the business of a University, the voice of the students is the business of a University. Protesting is not a crime. Fighting for the students is not a crime. If anyone else has gotten an email from the administration threatening student conduct action, please let the UO Student Collective know. We will fight for you. The University of Oregon Student Collective is here to for the students. Support this movement by sharing this post. Post #iamtheuostudentcollective. Come to our meetings. Make your voices heard. You took the stage in the EMU Ballroom in a manner that caused a University of Oregon event (President Schill’s State of the University Address) to be suspended. You were asked on multiple occasions to cease the behavior, and failed to stop after being clearly directed to do so by Dr. Kevin Marbury, Interim Vice President for Student Life. 1. Disruption of University: Engaging in behavior that could be reasonably foreseen to cause disruption of, obstruction of, or interference with the process of instruction, research, administration, student discipline, or any other service or activity provide or sponsored by the University. 2. Failure to Comply: Failure to comply with the reasonable directions of public officials acting in performance of their duties on University Premises or at a University Sponsored Activity when such conduct poses a danger to personal safety or property or obstructs or impairs educational or other institutional activities. You are invited to participate in small group dialogue with a variety of Officers of Administration who have expressed interest in meeting with you to hear your concerns and work with you to try to address them. This educational outcome will be scheduled during mid-to-late November. By choosing this option, you are accepting responsibility for your actions and agreeing to participate in the small group dialogue noted above. As a result, rather than a sanction, you will receive written warning for your behavior. As long as you honor this agreement and attend the group session, there will be no formal conduct process and this will not result in a student conduct record. To choose this option, please respond to this email within 7 days of today’s date. You will receive additional information within the next few weeks about the small group dialogue session and how to RSVP. By choosing this option, you are electing to contest the allegation. You will need to meet with me, or another decision-maker, to discuss the information we have received. This is called an administrative conference and is your opportunity to present additional information to ensure we have a full understanding of the situation. Following the meeting, a decision would be made regarding your responsibility for the violations listed above based on all available information and a “more likely than not” standard. If you are found responsible, you will be assigned an action plan (called sanctions under the Student Conduct Code). To choose this option, please call (541)346-1140 by November 6, 2017, which is 7 days from the date of this letter, to schedule a meeting. – If you fail to respond to this notice within 7 days, I will make a decision based on the information I have, without your input or agreement. – Normally, when a student is found responsible for a conduct violation, a $30 administrative fee is assessed to the student’s account. In this case, however, we have decided to waive the administrative fee. Neither option will result in an administrative fee. – Students have the right to an advisor at any stage of the student conduct process. Your advisor may not be another student who is involved in the alleged behavior. For more information about advisors in the student conduct process, visit our website (http://dos.uoregon.edu/files/Advisors.pdf). For more information about the Student Conduct Code, please visit http://conduct.uoregon.edu, or e-mail klarkin@uoregon.edu with any additional questions. We covered this in the sixth grade. Did UO’s Johnson Hall leadership skip that lesson? Fortunately our students didn’t. A University Nets a Huge Donation and Students Protest. What’s Going On Here? … So let us agree that the UO protesters were rude and perhaps misguided. Youth is, indeed, wasted on the young. Does that make their concerns about escalating tuition any less valid, especially considering the optics at play? After all, Phil and Penny Knight gave the university a $500 million donation a year ago. UO has a nationally renowned and (presumably?) lucrative football program. Michael Schill earns $798,400 a year, making him one of the highest paid university presidents according to the Chronicle of Higher Education’s salary rankings. And now, a few months after a proposed 10.6 percent in-state tuition increase, a new gift—and an anonymous one at that, replete with concerns about transparency and accountability—has added another $50 million to the pot. Indeed, there are many factors contributing to escalating tuition at public universities, including escalating health and pension benefits, ongoing budget cuts at the state level, and a broken federal student loan system. It’s understandable why people should be grateful for donor largesse. Without private philanthropy, things would get really ugly. Yet, it’s of little solace for many UO students facing a lifetime of debt, given the fact that it seems to be figuratively raining money all over campus. And so rather than lament the impetuousness of youthful rebellion, it would behoove donors and administrators alike to ask why students are frustrated and address the divide that seems to be widening with every new mega-gift. On Oct. 13, University of Oregon President Michael Schill wrote an opinion column for the New York Times on the protest that happened earlier this month. His column criticized the students who interrupted his State of the University Address, stating that silencing him was not a proper form of protest. Schill ignores the position of power he has as the university president and dismisses the different set of regulations that are given to him as a leader of this institution. In his column, Schill wrote, “One of the students who stormed the stage during my talk told the news media to ‘expect resistance to anyone who opposes us.’ That is awfully close to the language and practices of those the students say they vehemently oppose.” The reality is that these students are marginalized students from an institution that Schill leads. They demand respect and fair treatment after almost a century of neglect. The protester said this because they were done with the mistreatment and wanted to make it clear that they will continue to fight for the rights of all marginalized students on campus. …. The NYT op-ed focuses on the “UO Student Coalition’s” efforts to prevent him from giving his State of the University address. Information on the administration’s botched attempt to discipline the student protestors is here. Information on his administration’s treatment of Prof Nancy Shurtz for her stupid and offensive – but constitutionally protected – attempt to dress as a black doctor at a Halloween party last year (to promote his book on racism in the medical profession) is here. Information on the Duck athletic department’s efforts to prevent their athletes from speaking to student reporters is here. And so far as I can tell basketball coach Dana Altman and football coach Willie Taggart have suffered no repercussions for their efforts to discourage athletes from expressing political beliefs. Update: Then there’s the administration’s April 2016 fight against the “Divest UO” group’s protest, here. They followed this up with a proposed policy restricting the time, place, and manner of free speech, which they dropped in the face of UO Senate opposition in spring of 2017. All too often campuses are forgetting one of the most basic principle of the First Amendment: Speech cannot be punished simply because it is offensive, even deeply offensive. The most recent example of this occurred when an investigative report for the University of Oregon concluded that a professor had created a “discriminatory learning environment” by wearing blackface at a Halloween party in her own home. Earlier the professor had been suspended for doing this. No doubt many were offended by her actions, but unquestionably she was engaged in speech protected by the First Amendment and any discipline is unconstitutional. In October 2016, University of Oregon law professor Nancy Shurtz hosted a Halloween party for about 25 students, faculty members, alumni and family members. Her costume was wearing black makeup on her face and hands, an Afro wig, and a white doctor’s lab coat. She told her guests that she was inspired by the anti-racist message of Damon Tweedy’s memoir about a black man starting his medical career, “Black Man in a White Coat.” She also had recently attended her daughter’s white coat ceremony — a tradition that begins a medical student’s first year — and she noticed an almost complete absence of black men. She said that she meant to draw attention to the lack of diversity in higher education. Professor Shurtz exercised poor judgment in choosing her costume and not realizing that some would be very offended by it. But poor judgment and offending people cannot be a basis for a university punishing speech. In countless cases, the courts have been adamant that speech cannot be punished because it is offensive. The Nazi party had the right to march in Skokie, Ill., despite the offense to its largely Jewish population and the many Holocaust survivors who lived there. Members of the Westboro Baptist Church have the right to go funerals of those who died in military service and express a vile, anti-gay and anti-lesbian message. The government would have almost limitless power to censor speech if offensiveness is a sufficient ground for punishing expression. Likewise, it cannot be that a university can punish a professor’s expression on the grounds that it offends students and thereby will make their learning more difficult. That is the primary justification for punishing Professor Shurtz. If that is enough to justify suspending or removing a professor, it would provide a basis for doing so any time a faculty member participates in activities that make a significant number of students uncomfortable. Under this rationale, campuses in the 1950s would have been justified in firing professors who were perceived as having communist leanings or in the 1960s could have removed professors who participated in the civil rights movement on the ground that such speech made students uncomfortable and interfered with their learning. I, of course, am not arguing that free speech on campus is absolute. Campuses can punish speech that is incitement to illegal activity or that threatens or directly harasses others. Campuses also can engage in more speech, which long has been recognized as the best response to the speech we don’t like. There can be efforts to educate the community about the history of blackface. There should be debates about whether it is ever appropriate to use blackface even when advocating against racism in higher education. I would have hoped a law school faculty and a university president who is a lawyer and law professor would have recognized this. Unfortunately, what happened at the University of Oregon is all too typical of what is happening on campuses across the country where the desire to create inclusive learning environments for all students has led to punishing speech protected by the First Amendment. Does Disruption Violate Free Speech? … Contrary to the view of these protesters, individuals do not have a right to prevent others from speaking. It has long been recognized in constitutional law that the “heckler’s veto” — defined as the suppression of speech in order to appease disruptive, hostile, or threatening members of the audience — can be as much a threat to rights of free expression as government censorship. The only protections against the heckler’s veto are to require officials to make every effort to control the disrupters or to deter their efforts by treating the disruption as a punishable breach of the peace. Of course, it is possible that, despite best efforts, safety or public order cannot be maintained without calling an end to a controversial event. But this should be a last resort, only after exhausting all efforts to control those who are creating the threats against the lawful expression of speech. … Importantly, however, prohibitions against disruptions also have their limits. For example, protecting a controversial speaker assumes that the speaker has a preferred right to speak in a particular location at a particular time. When that is not the case — for example, in a true, open public forum on campus grounds, where anyone is allowed to be and to talk — no one speaker has any more rights to express a point of view than any other. If a Christian fundamentalist preacher were to use an open public space on a campus to preach against nonheterosexual activity, there is no reason why members of the campus community could not surround the preacher and enter into a boisterous back-and-forth. … The reason recent campus controversies are different is that, in those cases, the campus has created a process whereby particular people (for example, student sponsors and their invited guests) are given a preferred right to have access to specific campus venues through a reservation process. Once the campus has followed its policies and assigned rooms for particular activities, then those who have secured the reservations have recognized claims to that space at those times. In such a limited public forum, and in other places on campus where certain activities are assigned and recognized, those who have been given access to the space for certain purposes have the right not to be disrupted in that activity. … Also, while opponents cannot disrupt a talk by an authorized controversial speaker, it is true that the speaker has no right to a cooperative or supportive audience. Those who disagree are allowed to express their disagreement in ways that nevertheless allow the speakers to have their say. In the easiest case this includes the right to hold counterprotests or competing events, or distribute critical leaflets to audience members. But it also includes expressing disapproval as a member of the audience, as long as that disapproval does not undermine the rights of the speakers and their sponsors. There are always judgment calls in cases of disruptive protests. We favor a more accommodating approach when protesters focus on administrators, for practical reasons rather than because of the First Amendment. Campus leaders have many avenues to express their views, and so an occasional tactical decision to shrug off the disruption is understandable. But accommodation is much less appropriate when some members of the campus are attempting to prevent others from exercising their rights. In such cases, heckler’s veto principles argue in favor of strong campus rebuffs of the claims of the disrupters. Otherwise, vulnerable or controversial opinions will never be expressible on a campus. And that would represent an abandonment of foundational principles of modern American higher education. Simply put, the right to speak does not include a right to use speech to keep others from speaking. I’m no law professor, but I think this is the reverse of the preferred sequencing. I’ve had a number of conversations around campus with both students and faculty regarding the student protest of the State of the University address. The statement from Tobin Klinger to the Oregonian that the protest was in violation of the student conduct code is unhelpful and has irritated many faculty. Faculty see Klinger as an un-academic public relations spokesperson who has little credibility with the students or the faculty. However, he is an official spokesperson, and so we assume he was speaking for the administration. As such his statement could be taken as an abrogation of due process. This removes the veil of faculty oversight of student discipline, and there is simmering resentment that this power was taken from faculty by the Board of Trustees. 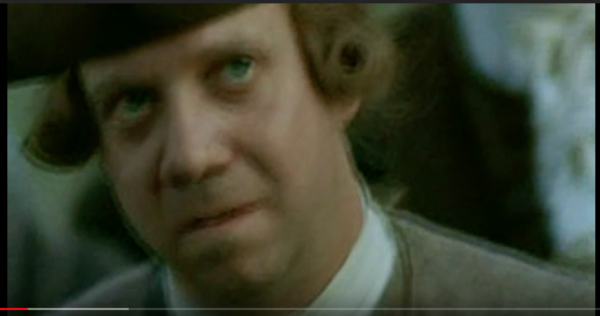 Any unilateral administrative establishment of discipline on an issue that revolves around speech is a hornets nest that is best left un-kicked. We do understand that it may sometimes be necessary to “read the riot act” to students to notify them (or others) that continued assembly will be dealt with under the student conduct code. My recommendation would be to have Tobin clarify his remarks and to state publicly that the university has no plans to charge any of the students in the protest with any conduct violation. Were actual conduct charges to be brought, I do not think you would have the support of the majority of the faculty nor students, and I think the Senate would react in a manner which you would find unproductive. A couple senators have already threatened a resolution to be introduced next Wednesday; we have a busy agenda that day and I would prefer to stay on task. As you know, I have invited [the UO student collective] to come to the Senate for a brief 5-minute presentation followed by a 5-minute question and answer period. [The UO student collective] has not responded yet. In conversation with faculty, more individuals agree that this is the correct course of action for the Senate than agree with you that this is rewarding bad behavior. I will not argue that we are not rewarding bad behavior, because I see your point, but I think more people are moved by the argument that these students have fewer avenues to air their grievances than you or I, and that this was a legitimate protest. I have been reflecting on my formal invitation of this student group to the next Senate meeting. Had I a do-over, I would take the advice of Frances White and merely indicate to this group that the Senate is a public forum on campus and that any group of students should be able to get on the agenda (with instructions on how to do so). This would allow the students an avenue for a public conversation without officially sanctioning it. I am unwilling to rescind my invitation to the student group, but I will hold onto this lesson for future use. Meanwhile, on the same day as the protest, the administration updated its website on Time, Place and Manner restrictions on free speech. They are calling these guidelines and procedures, not policies, because they agreed last year not to implement them as a policy, after the Senate raised numerous objections. Until 2014, the UO Faculty had responsibility for the Student Conduct code. The Board of Trustees took that away from us as part of their Delegation of Authority, helped out by the faculty board member Susan Gary (Law) who failed to notify the faculty about the power-grab. Just kidding. 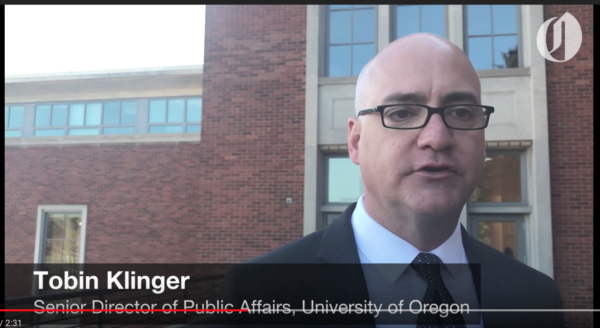 Tobin Klinger is UO’s chief PR flack, not a Student Conduct Judge. He is not responsible for enforcing the student conduct code, nor has anyone at UO conducted any sort of investigation as to whether or not the student conduct code was violated, or whether any such violation was significant enough to supersede the UO policies on freedom of speech and academic freedom. Speaking in my private capacity as a blogger, I think the administration can make a plausible case that it did violate the code (and the Freedom of Inquiry and Speech policy). If that case succeeds they can then discipline the students accordingly. But that case is going to be harder to make given this official statement from Klinger, which the students can argue is prejudicial. … Just last week, students shouted down talks at Columbia University and the University of Michigan. Those doing the shouting down were generally students aligned with the political left, but supporters of President Trump also shut down a talk at Whittier College by California’s attorney general, Xavier Becerra, shouting “America First” and “build that wall” to prevent him from answering questions. And those events followed the interruption of speakers (sometimes preventing events from taking place at all) at the College of William & Mary, Texas Southern University, the University of Oregon and Virginia Tech. University of Oregon President Michael Schill was quick to dismiss the protesters of his Oct. 6 State of the University Address on the grounds that “they don’t understand the value of free speech.” While I believe he may be well-meaning in his desire to “teach all of our students and members of the community the value of free speech and tolerance,” Schill fails to acknowledge the defect in his fundamental misunderstanding regarding freedom of speech. Namely, he ignores the fact that speech is tied to access. It is strange that Schill, who has the loudest voice on campus and multiple platforms at his disposal, can claim that his rights and freedoms are being infringed upon, while other’s voices are being silenced. … Friday’s protest painted the UO student body as unwilling to listen to the viewpoints of others. College students around the country have been criticized recently for shutting down the speeches of controversial right-wing figures such as Milo Yiannopoulos and Ben Shapiro. What happened Friday was worse. Schill wasn’t there to spew hate-filled rhetoric – he was a university president doing his job. We got the radical action. Still waiting on the radical change. The organizers failed to suppress anything, as UO released a pre-recorded version of the speech minutes after its cancellation. Instead, the event made headlines for its spectacle and painted the student body as rude, unfocused and angry about … just about everything. Students who are unhappy with school administration should absolutely protest and make their concerns heard. The repeated tuition increases are a legitimate gripe, and Schill comes across as tone deaf when he tells students to ask their parents for money or take on more debt. But shouting him off the stage isn’t the way to address those concerns. The Black Student Task Force has shown that respectful protest can effect change on this campus. Not all of their demands have been met, but they got things done by showing a willingness to work with administration rather than drown it out. For change to happen, there must be dialogue with those in charge of making the changes. Suppressing the speech of others is not how to move forward. For on the protest and the prejudicial response from UO spokesperson Tobin Klinger see the “free speech” tag.